Morels…be careful where you step! March, April, and May can be the most vexing months especially during the last few years when nothing that was before seems to be happening now. Last year we had our last snow on May 31st. Now as I glance over at the window, instead of just rain plastering the window, I see it has changed to lumpy rain. I guess you would call it sleet. The rain has been doing the job of melting mounds and mounds of snow, and opening up the wild landscaping to the previous fall’s compressed, tan detritus. It’s around 8:00 PM, so the temperature is most likely dropping. It is blowing about 35 from the ESE with gusts to right around 50 right now. There is very little visibility out in the bay or surrounding mountains. Can’t even see the mountains. Yesterday it was almost that “S” word that we don’t say out loud or in print, just in case we jinx the season. This morning everything was frozen. Now it is blowing like hell. Don’t get me wrong; I’m not complaining. 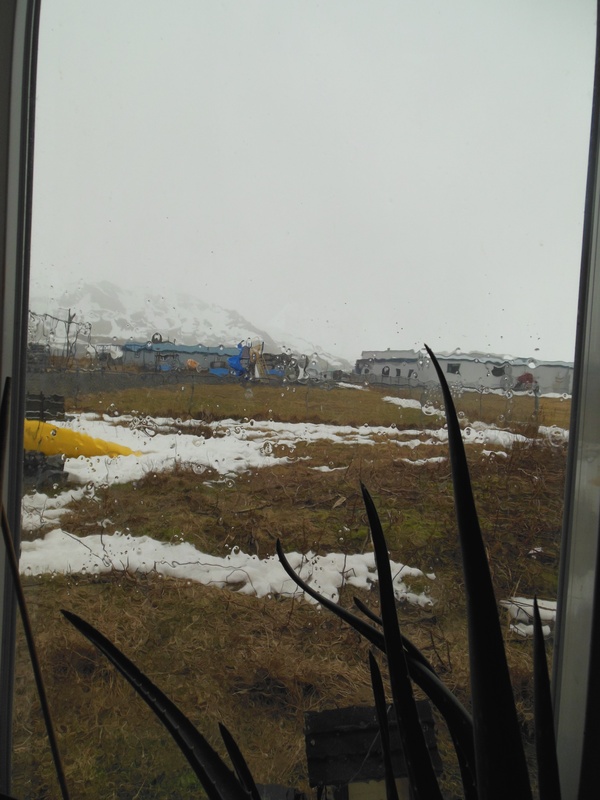 If there is one thing you can say about weather in the Aleutians it is that it is never boring. It keeps you on your toes. I should probably invest in a waterproof casing for my camera. As it is, I have to decide when is too wet and wild to take the camera out. How much time do I want to spend wiping it down when I come inside? When you grow up in a place known as the birthplace of the winds, you learn to judge how much the wind is blowing by observing the environment. The first thing you observe is that there is always wind. White caps generally start when it is blowing 25. You can see gusts coming by the way they darken the water….black water. We all look intently for black water at either end of the runway when we are making an approach to land. Black water at the end of the runway is very, very scary. 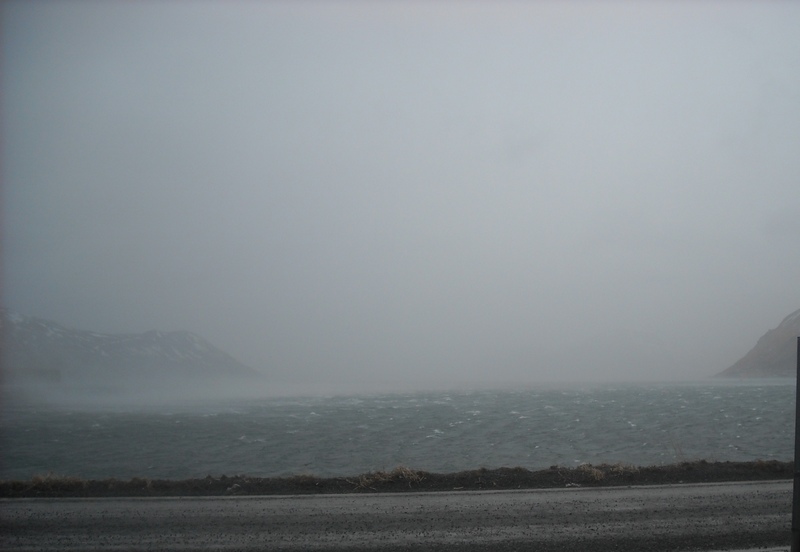 You know that when the gusts are picking up water off the sea, it is blowing at least 50. When that happens we call them williwaws. So while we wait to find what these next few months will bring us, I will just continue to be exhilarated by the weather. Ah, yes. I live in the birthplace of the winds; the islands of the smokey seas. Just weathering the winter, lol. Weather is such a huge, huge part of our lives out here….everything is hinged on the weather, so you just have to have the right attitude and accept whatever impacts, good or bad, that it has on you. That’s how you stay healthy!! I always love your snapshots. I also love a rainy day. I just can’t stand the wind, and when you get rain and sleet blowing in your face at those speeds it can sting. My mom and dad have an old reel to reel tape recording of my sister and I recounting our walk to Sunday school when it was blowing like crazy. It is hilarious and I am shocked and appalled (NOT) that they let us out by ourselves, lol. Unangam tunuu word or words of the day…. Respect Elders, including parents, teachers and community.